Those crazy Canucks are at it again, and this time in car form! You’ve joined us for events such as GoldRush Rally 2011 and Targa Trophy 2010, so you’re familiar with the various long-distance racing events. Well, Canada hosts one called the Targa Newfoundland. As for the Enzo, it was tuned by German tuner Edo to be a roadgoing version of the FXX, and it looks the part. Sources say that it’s capable of 0-60 in 2.8 seconds and top speed of over 240mph due to its 840hp powerplant. While we’re very sad to see another Enzo crash, we’re very glad the driver was unharmed and that water damage is about the only issue with the car. We’re confident we’ll see it back on Canadian icefields roads in no time! Chad Waite on September 19, 2011 at 12:57 pm. Call me crazy, but I’m not sure I like the look of that car. I think the Enzo is one of the best looking vehicles ever made, but the FXX tweaks to it have kinda killed it. 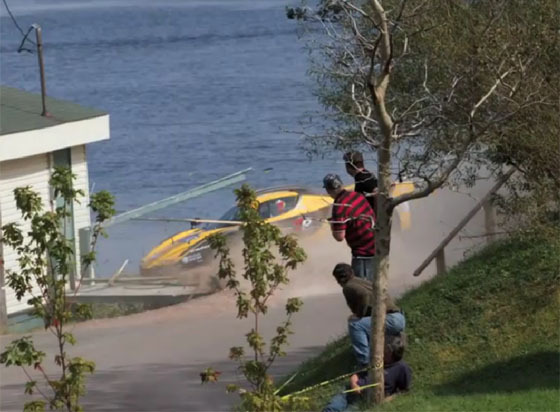 Glad the driver/navigator/car are all ok.
AJ Wilcox on September 19, 2011 at 1:00 pm.